1. 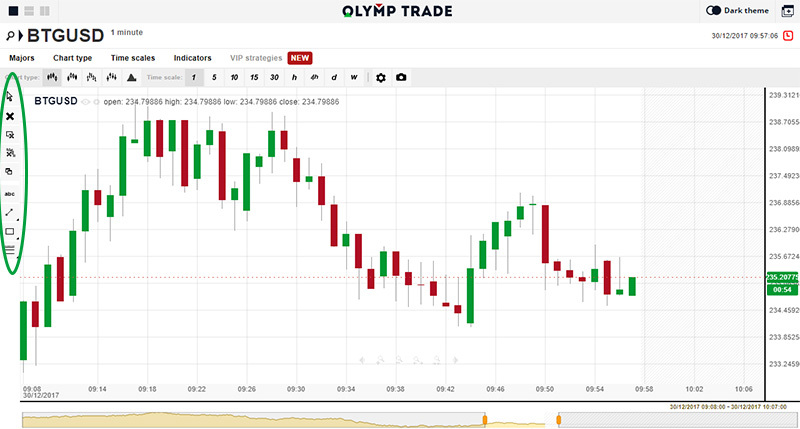 How to open an Olymp Trade binary option demo practice account for free ? You can open a free demo account free of charge and practice as long as you want to get use to the system. You can register using the link below. Choose "Start Trading" link in website. Choose "Registration" tab from the popup window that you got. 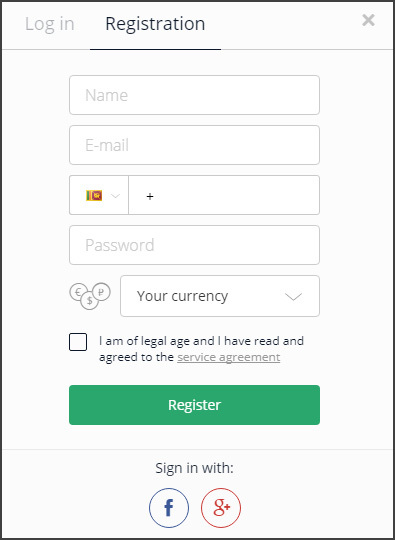 Insert your name, email, phone, password and choose "Your Currency" as "Dollar" from the popup window that you will get. Then place a tick for "I am of legal age and I have read and agreed to the service agreement". Next click the "Register" button. You will receive an email shortly from Olymp Trade, asking you to confirm your email address. So click the link in that email to verify your email address. Registration is complete now ! Once your registration is successful. You will see a similer window like the below one. So let's see the features of Olymp Trade platform and how trading can be done using the web platform. You can choose Area Chart (Default ), Japanese Candlstick ( Most suitable ) or Heiken Ashi charts from this section. You can choose and add any popular indicator to your charts ( SMA, EMA, MACD, Parabolic RSI etc.. ). You can shift between Demo and Real Live account using this section. 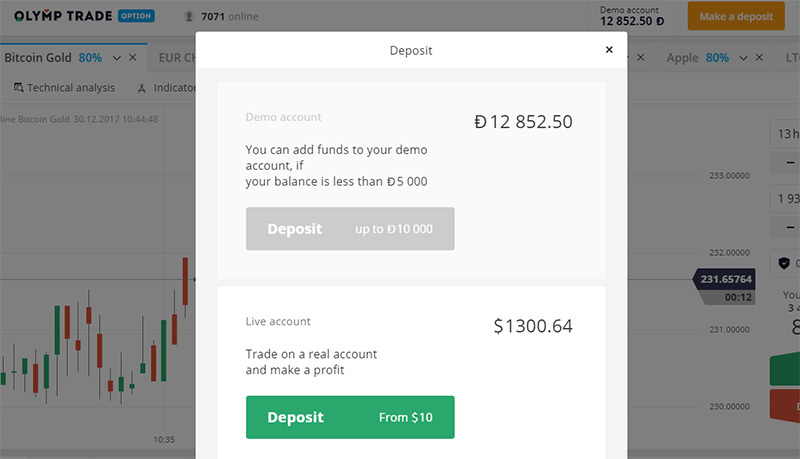 You can deposit money to your live account ( You can learn about the process later on in this article ) or reload the demo account using this section. You can use live chat option to get customer care support when ever you need any help. You can choose trade expiry time between 1min - 13 hrs period from this section. You can choose the amount that you are going to use per trade using this section. 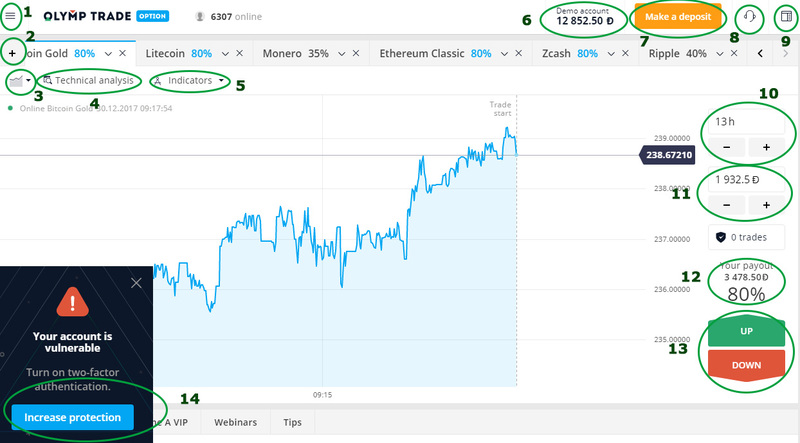 This section displays the amount that you will receive as profits for successful predictions. This is the section to enter the trade. Choose "Up", if you assume the price may go up based on your analysis. Choose "Dowb", if you assume the price may go down based on your analysis. Trade 100% free and also without any risk using the free demo account to make sure you learn trading properly and practice in order to do live trading ( any time you can start live trading ). Also make sure you consider following facts too when executing a trade. 3 Did I consider the Support / Resistance ? 4 Did I consider the chart patterns and candlestick patterns ? In case the demo account capital falls below 5000D, you can reload it using "Make a deposit" yellow button on top. Click "Deposit upto D10,000" which appears on the pop up window. It will get fully reloaded ! Once you are successful in demo practice account, you may enter live trading as per the below details. 4. How to deposit real money to Olymp Trade Binary broker ? You can add real money to your account at any time and start live trading. So let's see how you can do it. You will get a window as below one. 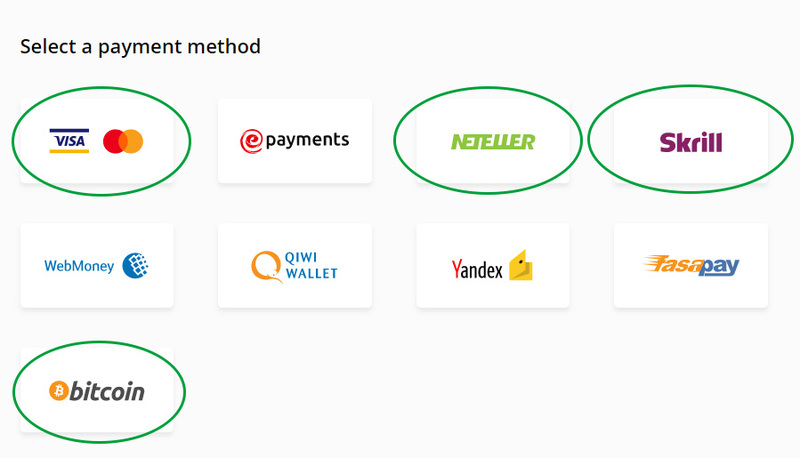 You will get options like Skrill, Neteller, VISA, Master and Bitcoin as funding methods. It is more suitable to use Skrill or Neteller to fund the broker account because if you use Visa/Master cards directly, you will be only able to withdraw the amount you have deposited and to withdraw profits you will still need one of the above e-wallets. So better to start with Skrill or Neteller. You can deposit $10 to $5000 at a time. Depending on the amount you plan to deposit, The "account balance" will show how much will be credited to your account and how much you will get with bonus on right hand side. 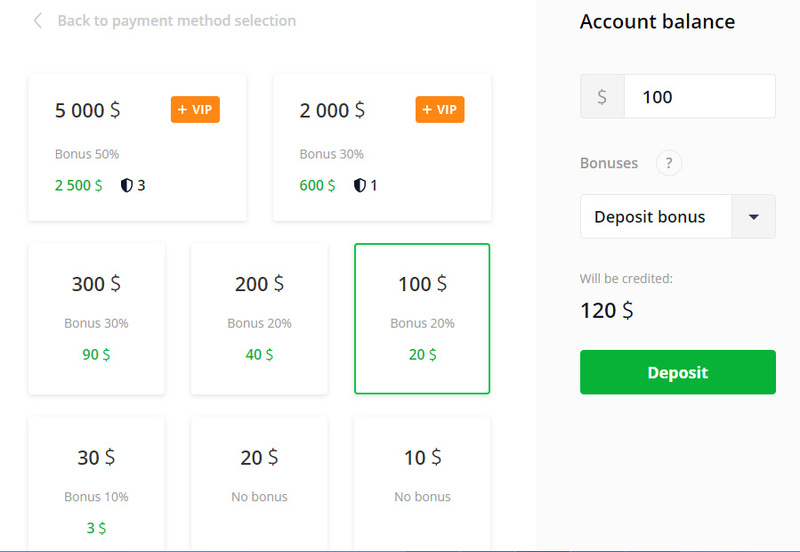 If you do not want to get bonus, Choose "No Bonus" instead of "Deposit Bonus" from "Bonus" section. ( if you wish to receive a VIP account, You will have to deposit $2000 or more. In VIP accounts, they allow certain number of non risk trades ). Ok, Let's choose the amount you wish to deposit and click "Deposit" button. Then you will get a page where you have to enter the ewallet / card details to make the payment. That's it ! 5. How to make money withdrawals to e-wallet ? You can do it easily. Go to "Menu" ( The three dash icon on top left ). Choose "Withdraw" link in it. Then from the next page that you get, enter your skrill / neteller account details and amount you need to withdraw. Finally choose"Send a request". You will receive you funds within a maximum of couple working days. If you still did not verify the email address. Please login to your email account and looks for a confirmation email from Olymp Trade broker ( Also check the j-unk folder as well. Sometimes it may land in it depending on your security / email server settings ). Once you locate the email, open it and click the confirmation link in it. You can submit these documents when they request you to do so. If you wish to get it verified before that, you may send a message to live chat saying that you need to get your account verified, they will send you an email address to which you need to send the necessary documents. You will need the following documents. i) Selfie photo with your Passport ( page that contains your details ) where your face & shoulders should be clearly visible. ii) Scan or Camera copy of the page in passport with your details. Your account will get verified in around 2 - 14 days. International Financial Commission ( FinaCom ) of Belize Government regulates Olymp Trade broker. You can learn more about it using "Regulation" menu link in website. You can trade safely as Olymp Trade is a regulated broker. I want to work at olymp trade. Read the article carefully Ibrahim. Then Use the Practice account until you make a decent profit. Then you can start trading using real money.